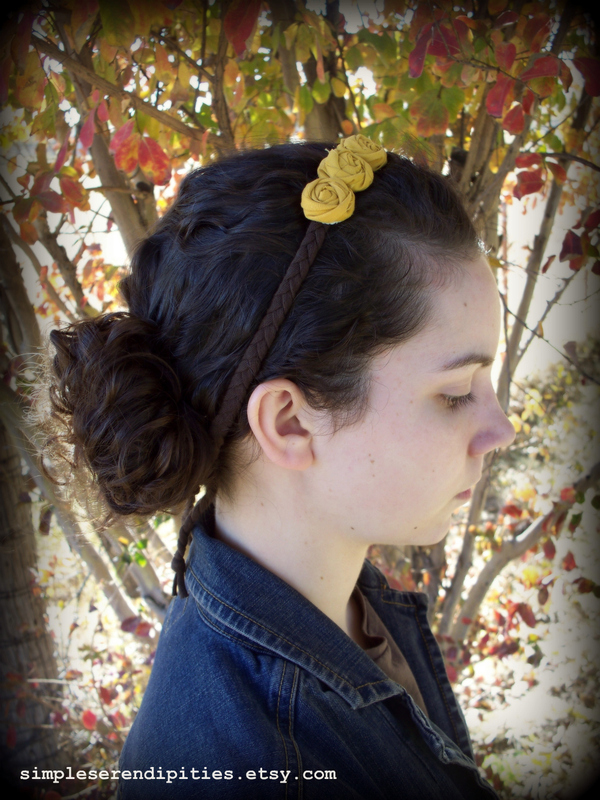 The winner of the Flower Pin Giveaway is Hannah B. Congratulations, Hannah! I hope you enjoy the pin. Winter weather is coming - are you prepared? 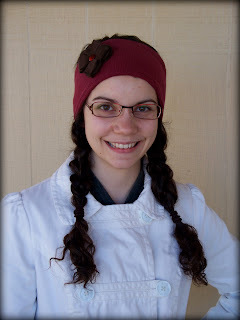 I recently made this ear warmer/headband out of a thermal knit shirt that I didn't wear anymore. It is very warm and cozy! 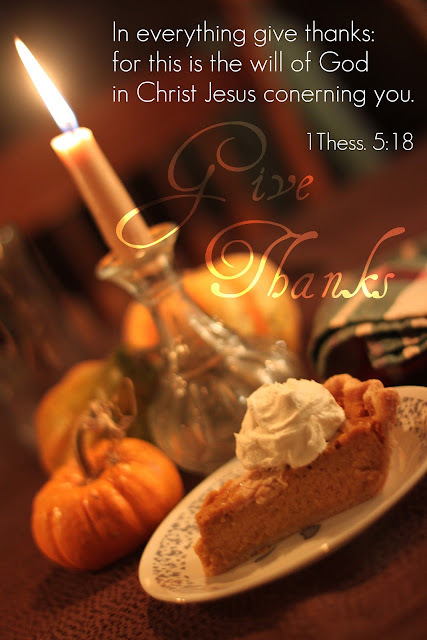 I made this one for my sister, Abigail. Look at the adorable flower she made for hers! Want to make an ear warmer now? 1. 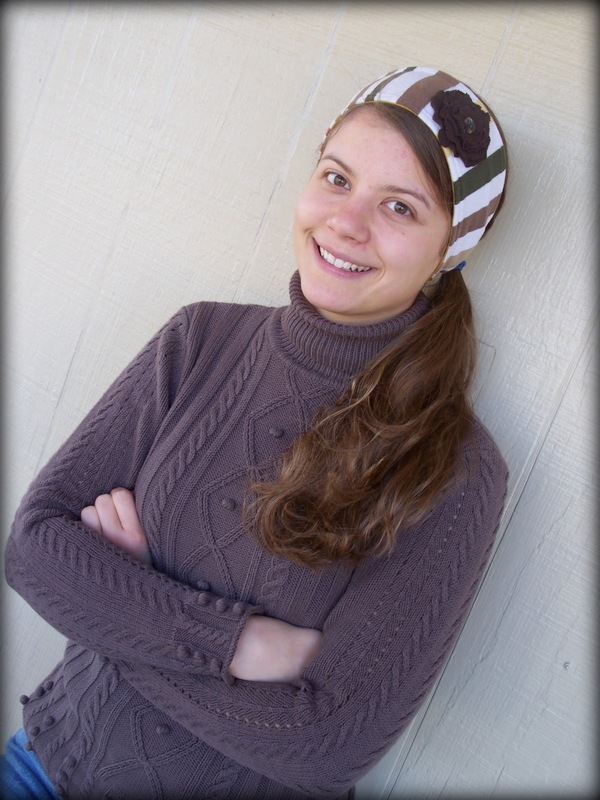 Measure your head where you would wear the ear warmer. Then subtract 2 1/2 inches from that measurement. 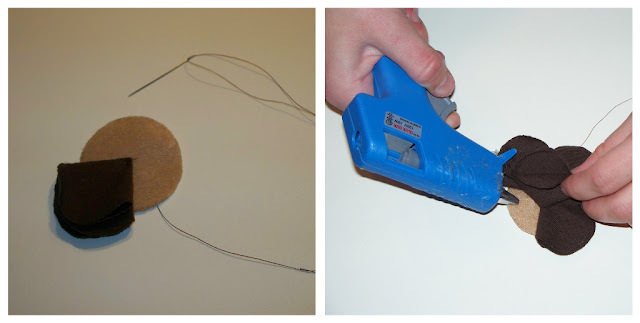 Make a pattern using that number for the length and 5 inches wide. Taper the ends so it doesn't bunch up under your head. 2. Cut your ear warmer pattern out. 3. With right sides together sew down the edges to make a tube using a 5/8 in. 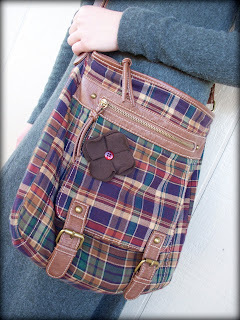 seam allowance. On one side start and stop sewing about 1 1/2 in. from each end. 4. Trim seam allowance to 3/8 in. Clip seams around the slight curve. 5. Turn right side out. 6. 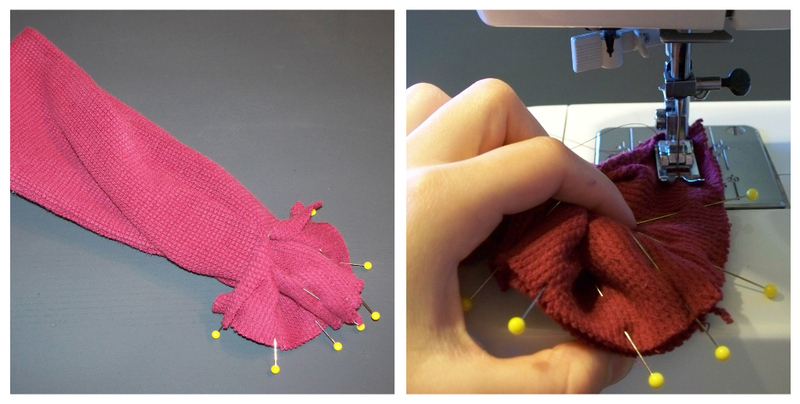 With right sides together, sew the short ends of the ear warmer together. 7. 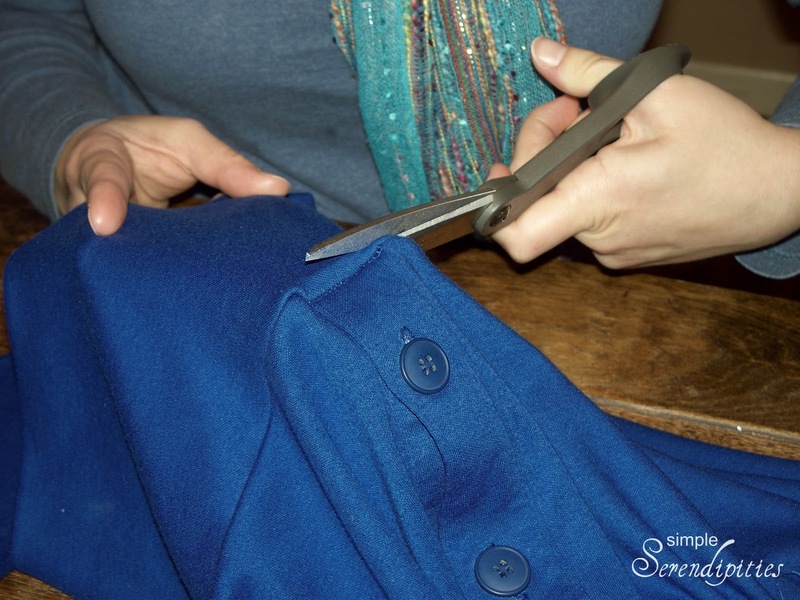 Fold the seam back into the tube and tuck the raw edges at the opening to the inside. Press. 8. Using a 1/4" seam allowance top stitch around both sides of the earwarmer. Now let's make the Flower Pin! Draw a circle and divide it into quarters. 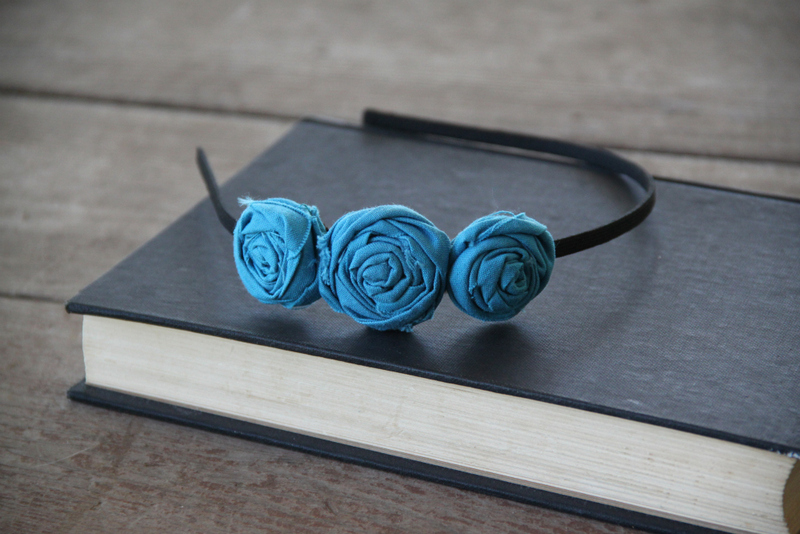 Make four petals. 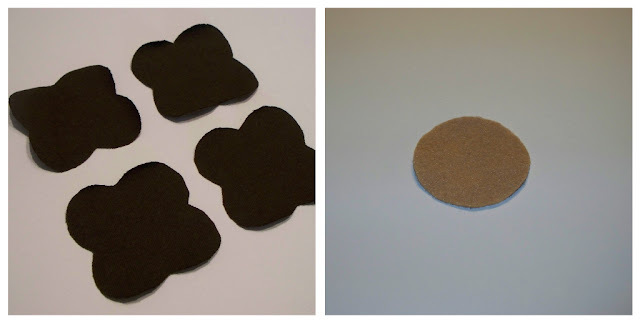 Cut out four flowers from your pattern and one smaller circle out of felt. 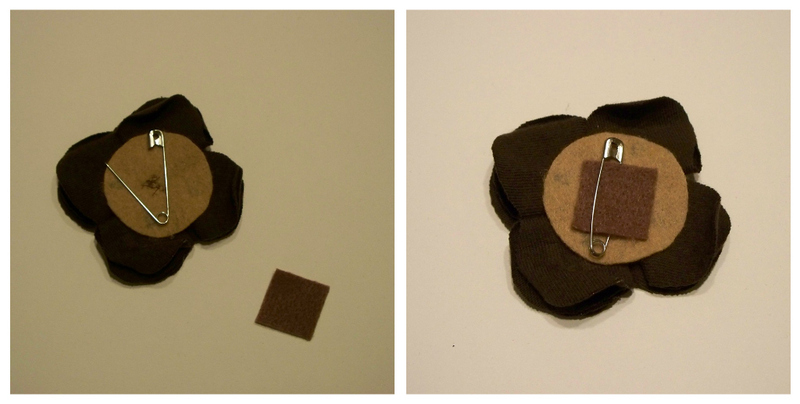 Fold each flower into fourths, tack it with a few stitches on to the felt circle, and glue to secure. 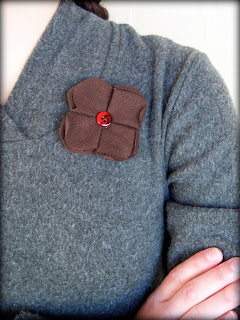 Sew on a button and you have a cute flower! To add a pin cut a small square out of felt and glue it onto the back of the flower over a safety pin. I would like to give one of my readers a flower pin/brooch like the one I showed how to make above. There are so many ways you can wear this pin. 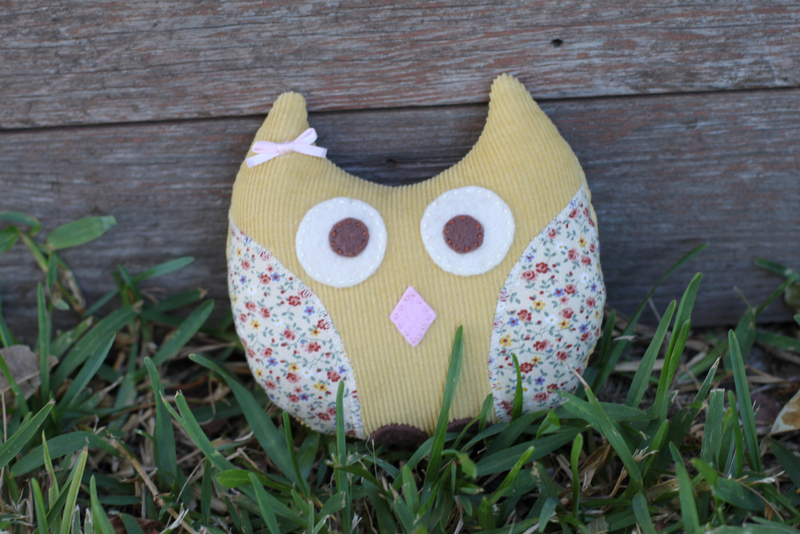 Visit my shop and leave a comment here telling me your favorite item in my shop. 1. Blog about this giveaway. 2. Facebook about this giveaway. I have been wanting a blog button for a while and just made one following this tutorial. (You can find it on my side bar.) How do you like it? 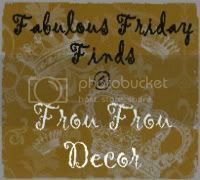 Feel free to add my button to your blog! 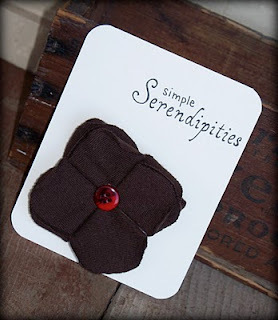 simple Serendipities, the shop, is back! After a vacation, we are back at work again with lots of new items. Visit to see great gift ideas for your daughter, sister or friend! 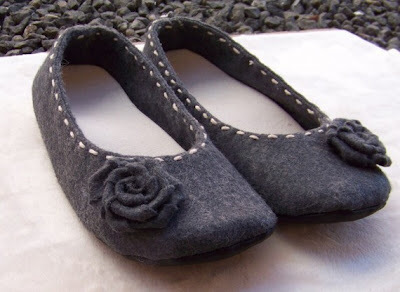 Have you ever heard of making your own shoes? That is something I've always wanted to do. 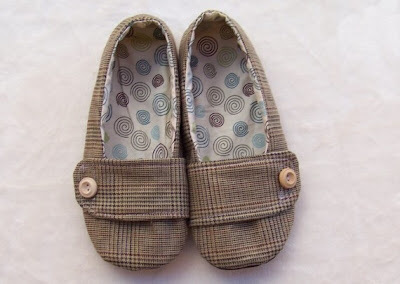 We just bought this pattern from Shoeology on Etsy. I am excited about making a pair! One to wear and the other for the fabric. But the skirt had a stain on it. 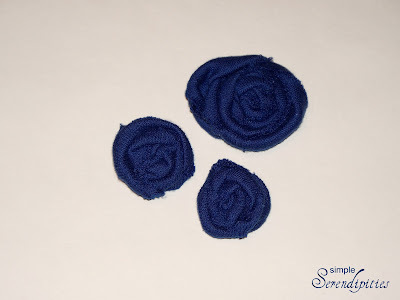 and cut strips to make three rolled roses. 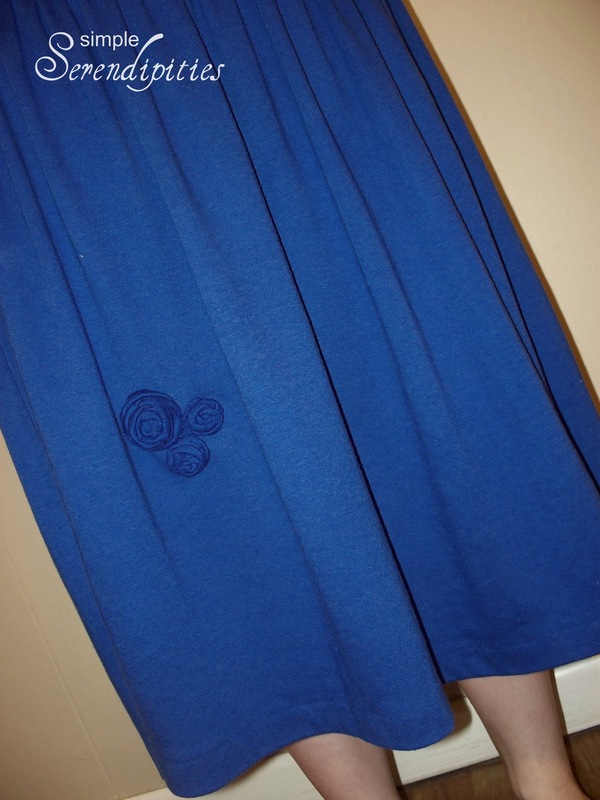 Then the flowers were sewn on the skirt to cover the stain and make it pretty! 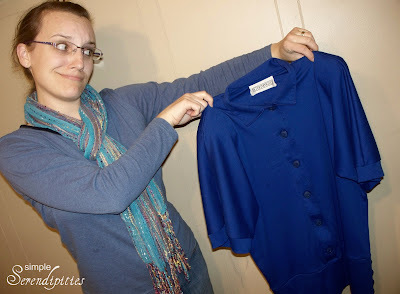 So, if you have some clothes you can't wear because of a hole or stain, don't throw them away. 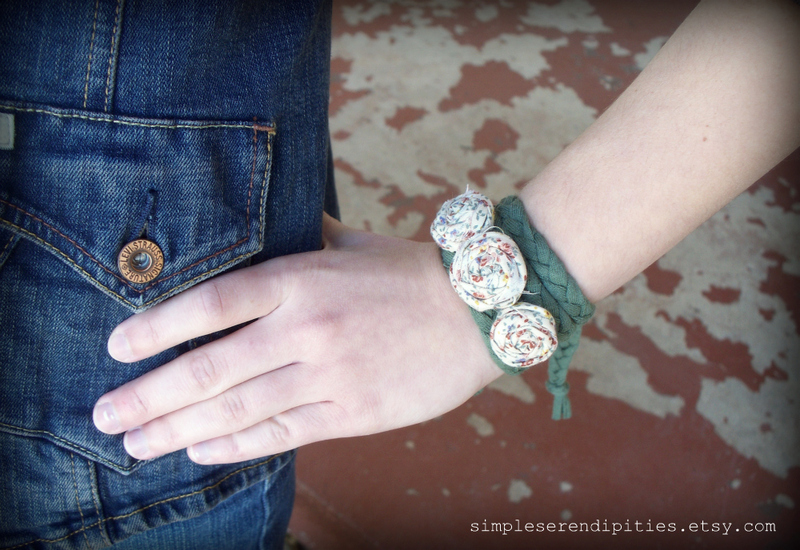 Try covering it up with a flower! This is my Shabby Apple dress design for Shabby Apple Dresses. I have been thinking about making this dress for a long time, and finally got started when I found out about Shabby Apple's Dare to Design contest. The inspiration for this dress came from "the t-shirt". I wanted a comfortable, casual cotton knit dress that I could wear every day. 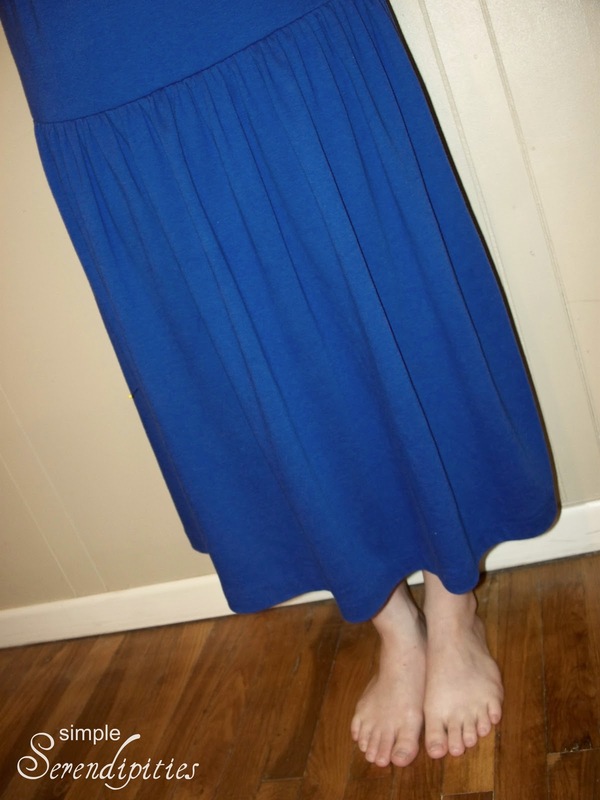 The top starts like a regular t-shirt and flares out into an A-line skirt. Drawstrings tie on the sides for a more fitted look. 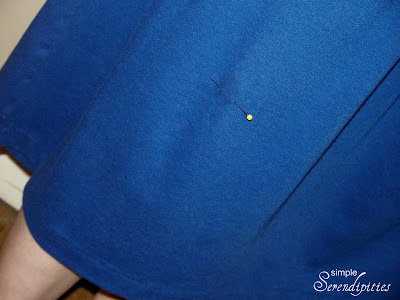 I used elastic thread to shirr the sleeves. I had never used it before and I love the way the sleeves turned out. I had fun making this dress. 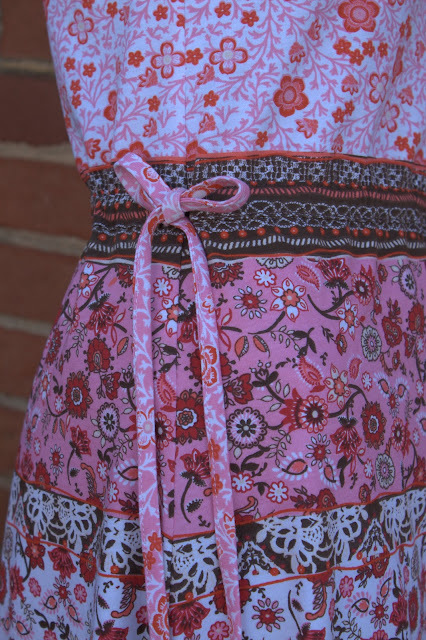 I have altered patterns many times, but this was my first time sewing a piece of clothing with my own pattern. 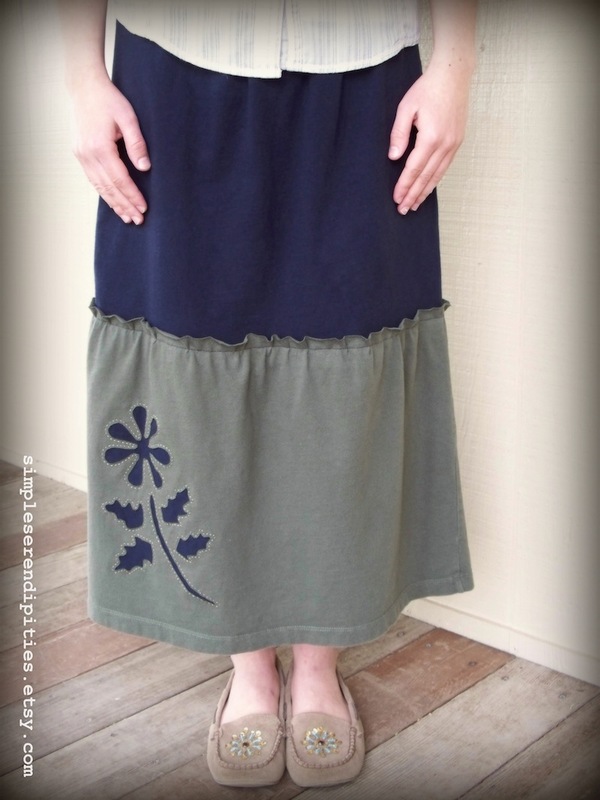 I think this dress would also look nice in a solid color with some applique design on the skirt. That is what I am going to try next! 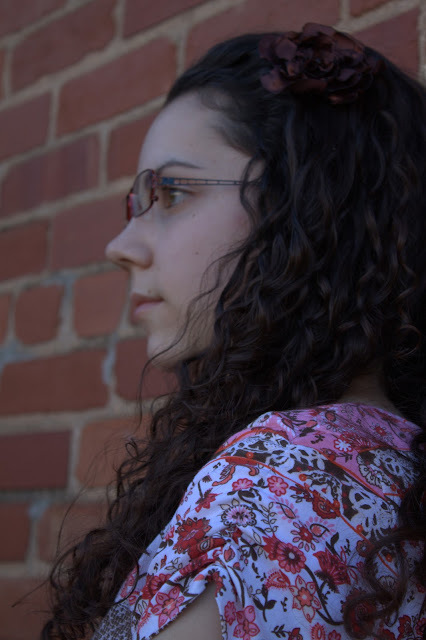 Thanks to my sister Abigail for her wonderful photography! 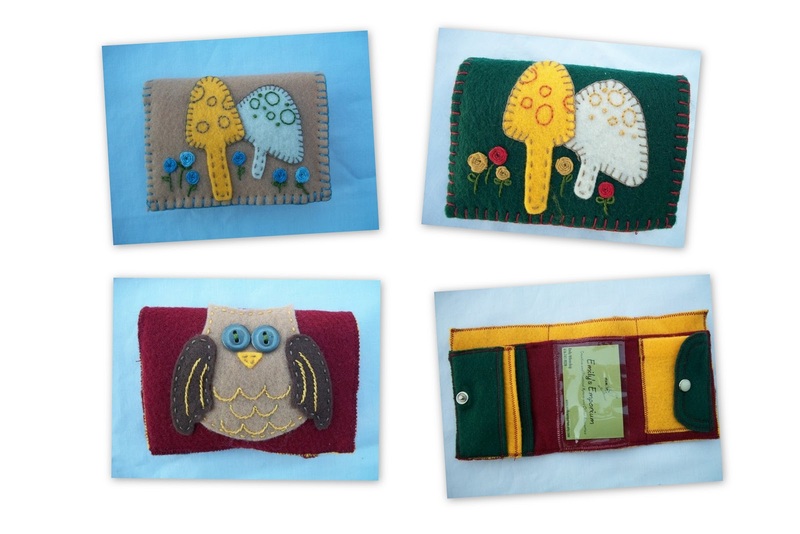 My sister Emily has reopened her Etsy shop and is selling felt wallets on which she appliques so beautifully! If you are in need of a new wallet you should definitely go shop at Emily's Emporium. The Fiesta was last Saturday! I had a wonderful day selling handmade items and visiting with friends. We sold almost all of the hair pins, clips and wallets, half of my owls and a few coasters. My mom baked wheat bread, pumpkin bread, cinnamon rolls and cookies which sold very well. Here are some photos of the booth. © 2010 - 2012 Alison Shamburger. Powered by Blogger.